Seniority is not an age, it's an attitude! With the leadership of Suzanne Kirchner, Nancy Daniels, and Kaye Hoggard, a new seniors fellowship group has begun at St. Margaret's. There's no particular age restriction, so the group is called "PrimeTimers" and the intent is to get older church members, retired or not, to gather regularly for fellowship, fun and service. 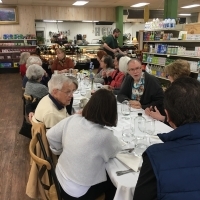 It all began with a holiday luncheon in December, and then a brunch for about 20 participants last week. Next month, a GameDay is planned on March 2nd (1:00 - 3:00) in the Welcome Center. Everyone is invited to bring a favorite board game and a snack to share. If you're interested, you can also learn more at the group's Facebook page.